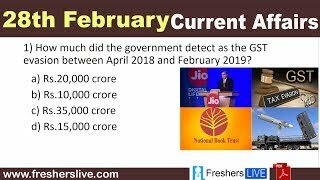 Current Affairs 28th February 2019: Instantly obtain Latest Current Affairs 28th February 2019 with all essential info, Be the first to know all the Current affairs 28th February 2019 top news, Major Issues, Current happenings, Important events in National as well as International level with clear explanation. For all competitive exams and Interviews, equip yourself with the Latest Current Affairs 28th February 2019 granted here. Minister of Railways and Coal, Piyush Goyal has launched Rail Drishti dashboard, to promote transparency and accountability of Indian Railways. Rail Drishti Dashboard is an online portal containing information related to passenger and freight trains and links to live feeds of IRCTC kitchens. The 16th edition of BioAsia 2019 -Asia’s largest biotechnology and life-sciences forum was conducted in Hyderabad, Telangana. It was inaugurated by the Governor of Telangana –E.S.L Narasimhan . The theme of the conference was “Life Sciences 4.0 – Disrupt the Disruption”. Assam Chief Minister Sarbananda Sonowal launched the PRANAM Commission, which is a panel set up to look after the issues concerning a Bill brought in for the protection of parents of state government employees. Vice President M Venkaiah Naidu launched the book titled ‘Quality, Accreditation, and Ranking – A Silent Revolution in the Offing in Indian Higher Education’ The book is edited by Education Promotion Society for India’s (EPSI) Alternate President Dr. H Chaturvedi in New Delhi. On this occasion, the UGC Chairman, Dr. DP Singh, and Management Guru Padma Shri Dr. Pritam Singh were present as the guest of honor. Union Textiles Minister Smriti Irani inaugurated the ‘Titanwala Museum’ that showcases the hand block printing of the Chhipa community in Bagru. Bagru printing is one of the traditional techniques of printing with natural color followed by the chippas of Rajasthan. Suraj Narayan Titanwala took the initiative of setting up the museum. As per Hurun Global Rich List 2019, Reliance Industries' 61-year-old Chairman Mukesh Ambani is the world's eighth-richest person with a net worth of $54 billion. He is the only Asian among the top 10. Amazon's Jeff Bezos topped the list for the second consecutive year with a net worth of USD 147 billion. With a wealth of USD 96 billion, Microsoft founder Bill Gates ranks second, followed by Warren Buffett with net worth of USD 88 billion. Buhari, of the ruling All Progressives Congress party, secured 56 percent, or 15.2 million votes, in the February 23 polls. His main opponent, former vice president Atiku Abubakar of the People's Democratic Party (PDP), received 41 percent or 11.3 million votes. Muhammadu Buhari, 76-year-old, has been re-elected for a second four-year term. He was first elected president in 2015, becoming the first opposition candidate to defeat an incumbent and win the presidency. Defence Acquisition Council (DAC) granted approval for procurement of three cadet training ships for the Indian Navy, which would be utilised to provide basic sea training for officer cadets including women officer under trainees. DAC meeting was chaired by Defence Minister Nirmala Sitharaman. DAC is the highest decision-making body for defence purchases.